Whilst the sun is still high in the sky and the garden continues to offer up seasonal treats, have a go at this summer stew. It’s a delicate combination of sweet, succulent runner beans with a paprika kick from the chorizo which balances the flavours perfectly. I have been lucky enough to be given some beautiful runner beans by a green fingered friend so it’s time to do the humble runner beans justice! We have also grown tomatoes in the garden this year so I have also used these for this recipe. 1. Heat a glug of vegetable oil over a medium heat and add the finely chopped onion along with diced chorizo. Cook until the onion softens and the chorizo begins to turn golden. 2. Add the garlic and fry until fragrant- this will only take a couple of minutes. Be careful not to burn the garlic as this will make the dish bitter. Add the halved cherry tomatoes and cook until they start to give up their beautiful juices. Try and use the best cherry tomatoes you can find, the more perfumed and sweet the better! 3. Pop in the water or stock if you prefer and bring to a gentle simmer. 4. Now for the stars of the show: the runner beans. 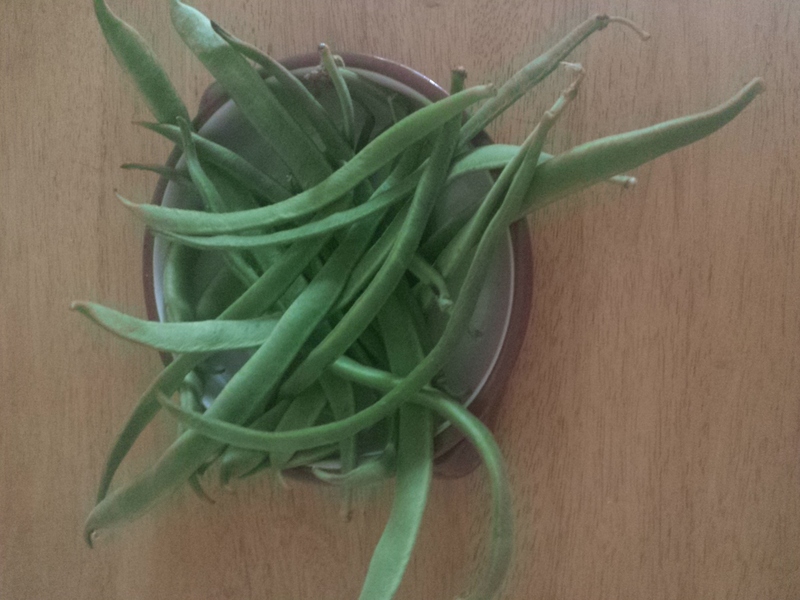 Runner beans can often have strings which will need removing before cooking. Top tip: run a potato peeler down the sides of each bean for a speedy way to prepare them. When you have done this the beans need to be cut on the diagonal into long strips. 5. Add the runner beans into the pan of simmering tomatoes and cook until the beans are tender. This should take around 30 minutes but do check them occasionally- the bigger the beans are, the longer they will need. 6. Serve the stew in warmed bowls. I like to crisp up some extra cooking chorizo and sprinkle this over the stew for added texture and because I love the stuff! You may like to offer some fresh bread alongside so you can mop up the deliciously spicy juices. 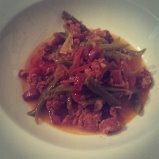 Runner bean and chorizo stew- a perfect warmer for an autumnal day! This entry was posted in Recipes by sotiris14. Bookmark the permalink. This sounds just like my kinda dish – will give it a try and report back! Hi Lisa. Thanks for your comment! It was delicious- I wished I had made more of it! Although I did have a cheeky nibble on some of the chorizo as I went…..